An aneurysm is a saccular dilation of an artery that typically occurs at a branch point or curve in the artery’s course and generally points in the direction of blood flow. Usual aneurysm morphology consists of a neck (where the aneurysm originates from the parent artery), the body or fundus, and the dome. Small perforating branches that supply adjacent brain arise from the neck at some aneurysm sites (anterior communicating artery, internal carotid artery bifurcation, and basilar apex). Aneurysms enlarge and rupture at the dome, where walls are thinnest and there is frequently a daughter sac or lobe. Saccular aneurysms are thought to be acquired degenerative defects that develop in response to relentless hemodynamic stress. However, defects in the media or internal elastic lamina may be genetically or congenitally influenced. 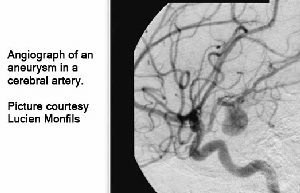 Aneurysms are named by their associated branch artery or, when not associated with a discrete branch, by their anatomic location. Aneurysms in the anterior circulation—in order from proximal to distal—include petrous ICA, cavernous ICA, clinoidal ICA, ophthalmic artery (OphA), superior hypophysial artery (SHA). The prevalence rate of intracranial saccular aneurysms is between 0.1% and 9%, with rates around 0.5–1% in angiographic series and around 1–6% in autopsy studies. Intracranial arteries lie in the subarachnoid space between the pia and arachnoid layers, a space filled with cerebrospinal fluid and compartmentalized into interconnecting cisterns. Consequently, aneurysms also lie in the subarachnoid space (except for petrous, cavernous, and clinoidal ICA aneurysms), and ruptured aneurysms produce subarachnoid hemorrhage. Aneurysm rupture is a potentially devastating event. Half of these patients die before arriving at a hospital from the effects of the initial hemorrhage, and many of the remainder die later of rebleeding or the effects of vasospasm. Survivors experience neurologic deficits in about 30% of cases. While saccular aneurysms are the most common type, other nonsaccular aneurysms include fusiform (atherosclerotic), dissecting, traumatic, infectious, and neoplastic aneurysms. Fusiform aneurysms are tortuous, elongated, dilated arteries with separate inflow and outflow. Traumatic aneurysms are the result of direct arterial injury, with rupture of all three arterial layers and fibrous organization of the surrounding hematoma. In contrast, dissecting aneurysms result from tears through—but no deeper than—intima and internal elastic lamina. Infectious and neoplastic aneurysms develop from circulation of infectious material or tumor cells, often from a focus within the heart (eg, bacterial endocarditis, or atrial myxoma). Infectious emboli lodge in small distal cerebral arteries and occlude flow, after which intense inflammation in the adventitia and media destroys the integrity of the wall and weakens it. Neoplastic aneurysms have a similar pathogenesis except that arterial invasion is directly from tumor cells. The resulting aneurysms are typically fusiform, eccentric, and at distal sites. Most aneurysms present with rupture. The classic presentation is a sudden, severe headache that may be associated with nausea, vomiting, painful nuchal rigidity, and photophobia. The critical features that distinguish this headache from other headaches are its instantaneous onset and its severity. When asked to evaluate severity on a scale from 1 to 10, patients typically respond with a number off the scale. They describe their headaches as “the worst headache” and can remember vivid details of events surrounding its onset. These symptoms are characteristic of a “sentinel hemorrhage,” a small contained leak from the aneurysm without frank rupture. Misdiagnosis of a sentinel hemorrhage can be catastrophic because patients have the highest risk of rehemorrhage. An estimated 60% of SAH patients who seek medical attention are misdiagnosed and for that reason have worse outcomes than those who are properly diagnosed. More severe hemorrhages produce seizures, neurologic deficits, impaired consciousness, and death. These more devastating presentations are often due to intraparenchymal or intraventricular extension of the hemorrhage or sustained elevation of intracranial pressure. Unruptured aneurysms are typically diagnosed incidentally during the evaluation of unrelated problems such as headaches or other neurologic symptoms. Still, unruptured aneurysms can present with symptoms related to mass effect or cerebral ischemia. The cranial nerve most frequently involved is the oculomotor nerve, which runs parallel to the posterior communicating artery and can be compressed by PCoA and basilar apex aneurysms. A patient presenting with a new oculomotor palsy (unilateral dilated pupil with deviation of the eye downward and laterally) should be considered to have an aneurysm until proved otherwise. With PCoA aneurysms, the dilated pupil usually precedes the diplopia because of the greater sensitivity and peripheral location of the parasympathetic fibers within the nerve. Cavernous ICA aneurysms may also present with oculomotor palsy but in addition may involve the trochlear, abducens, and trigeminal nerves. These patients have an immobile eye, retro-orbital pain, and facial numbness or dysesthesias. AChA aneurysms rarely cause oculomotor deficits but can impinge on the mesial temporal lobe to produce epilepsy or can compress the optic tract. ICA bifurcation aneurysms can also compress the optic tract and, when giant, the internal capsule to produce a contralateral hemiparesis. Ophthalmic artery aneurysms lie under the optic nerve, and their growth to giant sizes ( 25 mm) causes progressive visual field loss, initially a unilateral inferior nasal field defect that may enlarge to involve the entire ipsilateral nasal field and the superior temporal loss in the contralateral eye (junctional scotoma). SHA aneurysms project medially toward the sella and produce bitemporal hemianopsias similar to those associated with pituitary tumors. Large or giant basilar aneurysms can cause pressure on the midbrain, causing a contralateral hemiparesis from compression of the cerebral peduncle or hydrocephalus from occlusion of the cerebral aqueduct. The oculomotor deficits from basilar aneurysms tend to spare the pupil and cause ipsilateral ptosis and weakness of upgaze. Large basilar trunk, vertebrobasilar, and vertebral artery aneurysms can compress lower cranial nerves or nuclei with corresponding dysphasia, dysarthria, hoarseness, gait instability, and incoordination. Giant aneurysms with intraluminal thrombus can present with ischemic symptoms if clot from the aneurysm embolizes downstream. This is particularly true with ICA and MCA aneurysms, manifesting with symptoms of aphasia and contralateral motor and sensory deficits. Ischemic symptoms account for 5–25% of symptoms from unruptured aneurysms. The diagnosis of SAH requires the confirmation of blood in the subarachnoid space, which can be accomplished best with CT scan. Blood is easily seen on noncontrast CT scan, with a sensitivity of greater than 95%. In addition, the location of blood provides clues to the aneurysm location and identifies associated intracerebral and intraventricular hemorrhage. Hydrocephalus is a common finding in these patients because subarachnoid blood interferes with the normal circulation and reabsorption of cerebrospinal fluid. Often this associated hydrocephalus is more responsible for a patient’s depressed level of consciousness than the hemorrhage itself and is reversible with ventriculostomy. Ultimately, the diagnosis of an intracranial aneurysm depends on its identification with catheter angiography. A complete angiogram includes injections of all four major intracranial arteries (both ICAs and both VAs), filmed in two orthogonal views (anteroposterior and lateral). Pre- and postinjection images are digitally subtracted to visualize just the vascular structures, removing shadows cast by the skull, skull base, and overlying opacities. These digital subtraction angiograms provide detailed information about the aneurysm location, anatomy, hemodynamics, other aneurysms, and collateral circulation. It should be remembered that angiographic images show the internal anatomy of an aneurysm, which may be much smaller than the external diameter of the aneurysm if it is filled with thrombus or coil material or thickened with calcium or atherosclerotic changes. Catheter angiography has its disadvantages, namely, it is invasive, time-consuming, costly, and associated with increased risks (dissection, embolization, aneurysm rupture, and groin hematomas). Still, it is the most definitive test for the diagnosis of aneurysms. Angiograms generated with MR or CT data (MRA and CTA, respectively) are newer imaging modalities that currently do not provide all the information that catheter angiography does. Both CTA and MRA are noninvasive and easier to obtain. CTA results are available quickly and may play a role in unstable patients with ruptured aneurysms who need to get to the operating room right away. MRA is slower and lacks the resolution of CTA or conventional angiography, missing small aneurysms less than 3 mm in diameter. However, MRI or MRA is becoming a common method of detecting unruptured aneurysms in patients with other neurologic issues that have to be dealt with. Lumbar puncture is the only laboratory study that needs to be considered in the evaluation of an aneurysm patient. There are two explanations for this inconsistency. The first explanation is a sentinel hemorrhage that has leaked so little blood that it is not radiographically apparent. In this case, cerebrospinal fluid may be blood-tinged and will not clear in successive tubes. The second explanation is a delayed CT scan performed days after the subarachnoid hemorrhage. A delay in seeking medical attention or in ordering the CT scan allows subarachnoid blood to disperse, making it difficult to detect on the imaging study. In this case, cerebrospinal fluid will be xanthochromic, indicating that blood has been present for days and is being metabolized. If the fluid from a lumbar puncture is positive for new or old blood, further evaluation with an angiogram is indicated. It should be noted that so-called “traumatic taps” yield fluid that initially is bloody but clears in successive tubes. This finding should not be mistaken for true SAH. Existing treatments are aimed instead at preventing the initial rupture or rerupture and reversing the effects of SAH, eg, vasospasm. There is little controversy about the need to treat ruptured aneurysms because of their high risk of rerupture. Furthermore, the mortality rate associated with rebleeding is 40%. Therefore, treatment is undertaken quickly after diagnosis, usually within 72 hours of the initial bleed. The only treatment controversy arises in poor-grade patients, since these patients have a poor prognosis to begin with and aggressive management will yield good outcomes in only 25–40%. Patients with minimal neurologic function, uncontrollable ICP, or who are moribund are managed expectantly. Still, it is difficult to predict outcome, and an aggressive treatment policy is generally more prudent. In addition to protecting against rerupture, early treatment enables aggressive postoperative management of delayed vasospasm with induced hypertension. Treatment is favored in young patients with long life expectancies, a family history of aneurysm rupture, multiple aneurysms, or documented growth. Conservative management is favored in older patients, those with small aneurysms and short life expectancies, or severe comorbid medical conditions. Ultimately, patient preferences will determine the final decision with unruptured aneurysms. After a ruptured aneurysm is diagnosed, the aneurysm is secured as quickly as possible. In the meantime, efforts are made to stabilize the patient. Most important is blood pressure control. Rebleeding is caused by absolute elevations in blood pressure and also rapid variations. Blood pressure should be monitored with invasive arterial lines in an ICU setting where intravenous agents or drips can be administered. Hydrocephalus is present in approximately one-fourth of SAH patients and resolves with the insertion of a ventriculostomy. External ventricular drainage can improve the clinical status of patients dramatically and is recommended in all obtunded or comatose patients. In addition, ventriculostomy allows ICP to be transduced and can guide preoperative management of increased pressures. In poor-grade patients, intubation and mechanical ventilation is usually needed to protect the airway and sometimes to hyperventilate the patient for ICP management. Other comfort measures such as bed rest, sedation, and analgesics help minimize agitation that might precipitate rerupture. Seizures can precipitate rerupture, and anticonvulsants are given in the immediate post-SAH period. Clipping of the aneurysm neck effectively closes the aneurysm and keeps blood from flowing into it. The clip application is done under direct visualization under an operating microscope, allowing preservation of flow in the parent and perforating arteries around its base. Once clipped, an aneurysm can be deflated or opened to removed blood and thrombus that might be compressing neural structures. Blood in the subarachnoid spaces can also be removed directly or diluted with irrigation, which may have some beneficial effects on subsequent vasospasm. Microsurgical clipping provides an immediate, durable cure for aneurysms. The recurrence rate after clipping is less than 1%, and after an immediate postoperative angiogram no follow-up imaging is required. Surgical clipping requires exposure of the aneurysm. There are many surgical approaches for aneurysms, but the most common is the pterional or frontotemporal craniotomy. It provides direct exposure of the internal carotid artery from its entry into the subarachnoid space to its terminus, working in the space between the frontal and temporal lobes. Extensive removal of bone from the skull base (pterion, sphenoid ridge, and orbital roof), as well as opening the lateral cerebral sulcus to further separate the frontal and temporal lobes, creates ample room to access all ICA, ACoA, MCA, and basilar apex aneurysms. Additional exposure can be gained by removing the orbital rim with the orbitozygomatic approach, commonly used for giant anterior circulation aneurysms and basilar apex aneurysms. Posterior circulation aneurysms are accessed through the far-lateral approach (PICA aneurysms), one of the transpetrosal approaches (VBJ, AICA, and midbasilar artery aneurysms), or a combined transpetrosal-subtemporal approach that communicates the regions above and below the tentorium in front of the sigmoid sinus. The vast majority of aneurysms (> 95%) can be treated with direct surgical clipping. However, aneurysms that are giant-sized, fusiform in shape, or lacking a defined neck may require alternative techniques such as trapping or proximal occlusion. These techniques can be performed safely if trial arterial occlusion with a balloon-tipped catheter is tolerated by the patient without ischemic deficits. Hypotensive challenge or cerebral blood flow studies increase the accuracy of balloon test occlusion. Bypass procedures are indicated in those patients who do not tolerate their balloon test occlusion. Wrapping an aneurysm with cotton is another surgical alternative used as a last resort, externally reinforcing the walls with a material that elicits an inflammatory reaction to promote scarring and thickening of the aneurysm. Endosaccular occlusion has become an acceptable alternative to microsurgical clipping during the past decade. This technique is performed using electrolytically detachable Guglielmi coils (GDC) deployed through transfemoral intra-aneurysmal catheters and angiographic visualization. In general, aneurysm coiling appears to have lower morbidity rates than surgery but higher rates of incomplete obliteration, making its long-term efficacy still unproved. Complications from endovascular coiling are different from those associated with surgery and include arterial dissection, intraoperative aneurysm rupture, parent artery occlusion, distal embolization, and groin hematomas. Although overall complication rates are around 8%, permanent neurologic morbidity is observed in around 4%. Mortality rates are up to 2%. Furthermore, endosaccular coils remain exposed to hemodynamic forces that can shift or compact the coils or promote growth of the aneurysm around the coils. Aneurysm recurrence after coiling has been reported in 5–45% of cases. Therefore, surveillance angiography is required and recurrences can pose complicated treatment issues. Currently in North America, endovascular coils are used as a primary treatment for elderly patients, those considered to have high surgical risk, and those who are medically unsuitable for surgery. The minimally invasive appeal of this treatment is increasing patient interest and demand. In addition, new deployment techniques that use balloons to protect the parent artery from coil herniation and new devices such as three-dimensional coils and stents make aneurysms with unfavorable anatomy treatable with endovascular methods. For example, stent-supported coil embolization lays a stent across a wide aneurysm neck and deploys coils through the interstices of the stent. Endovascular techniques have become an integral part of multimodality therapy for aneurysms and will be increasingly utilized in the future. Vasospasm is the narrowing of cerebral arteries from smooth muscle cell contraction in the vessel walls, leading to diminished cerebral perfusion, ischemia, and infarction. Vasospasm typically occurs during a time period 4–14 days after SAH and resolves spontaneously thereafter. Approximately 70% of patients experience some degree of vasospasm, with 20–30% developing ischemic symptoms. The mortality from vasospasm alone has been estimated between to be 5% and 15%, and the neurologic morbidity has been estimated at around 6%. Patients at risk of developing vasospasm are monitored closely in an ICU. It is started within 4 days of SAH and continued for 21 days, regardless of admission grade. Vasospasm is detected with angiography, transcranial Doppler ultrasonography (TCD), or changes in the neurologic examination. Angiography is the optimal diagnostic study but is limited by its invasiveness. TCD measures velocity of blood flow in cerebral arteries, which increases as arteries narrow with vasospasm. Therefore, measuring TCD velocities indirectly monitors vasospasm. TCD is noninvasive and can be done repeatedly to detect trends. Rising TCD velocities guide the timing of more aggressive measures, like hypertensive therapy and angioplasty. The mainstay of medical management is hypervolemia, hypertension, and hemodilution (HHH therapy). Volume expansion is achieved with packed red blood cells, albumin solution, or hypertonic saline solution. Invasive monitoring with either a central venous pressure line or a pulmonary artery catheter is required to guide fluid management. Volume expansion to central venous pressures greater than 8 mm Hg or diastolic pulmonary artery pressures of greater than 14 mm Hg is usually enough to dilute the hematocrit to under 35%. In addition, volume expansion may increase systolic blood pressure to desired end points. Endovascular therapies for vasospasm are becoming increasingly utilized when aggressive medical management fails, when TCD velocities rise, or when there are multiple risk factors for severe vasospasm. Transluminal balloon angioplasty mechanically dilates segments of large cerebral arteries that are in spasm, usually restoring the normal caliber of the lumen. This intervention immediately improves blood flow to ischemic brain and typically results in clinical improvement. Furthermore, the effects of angioplasty appear to last up to a week, which corresponds to the duration of vasospasm. The success of this intervention has largely to do with timing. Early angioplasty before or immediately after neurologic deterioration enhances its efficacy. TBA is limited to large cerebral arteries such as ICA, MCA, and ACA. Transluminal balloon angioplasty is limited to large vessels. Smaller distal arteries are not amenable to angioplasty and instead can be treated with intra-arterial papaverine infusion. Superselective infusion of papaverine, a potent vasodilator, can improve the caliber of vasospastic arteries, but the effects are short-lived (< 12 hours). Repeated treatments may be needed for severe distal vasospasm, which limits its utility. Outcome depends on the extent of damage done by the initial aneurysm hemorrhage or subsequent rehemorrhage, complications resulting from treatment, and complications resulting from vasospasm. Of these factors, the initial injury is most important. The patient’s preoperative status as assessed by the Hunt-Hess Scale is perhaps the best predictor of outcome. Good recovery can be expected in 97% of grade I patients, 88% of grade II patients, and 81% of grade III patients. In these low-grade patients, 55% resumed in their normal living conditions, 67% returned to full-time work, and 23% reported physical disabilities. In contrast, poor-grade patients (Hunt-Hess grade IV and grade V) have less favorable outcomes.